THE new era of Victorian Under 18s football began on the weekend with two triple headers at Craigieburn and Frankston. We wrap up how the six games played out and some of the better players on the day for each side. Calder: G. Prespakis, N. Crowley, G. Elarmaly, M. Muller, I. McNeill-Wren. Calder Cannons kicked off the new season on the right note with a 27-point win over the Western Jets in the first of three games at Craigieburn. The breeze made life difficult for both teams as they opted to use the grandstand side of the ground. 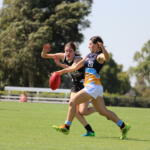 The Cannons were the first on the board through Gloria Elarmaly, before a response came from the Jets through one of Western’s AFL Women’s Academy players in Isabella Grant. The Cannons headed into the first break with just a one-point lead, but then a second term burst saw Makeisha Muller and Georgie Prespakis conjure goals out of nothing, while Neve Crowley also added a major to the total. An 18-point lead soon became 23 by the final break as India McNeil-Wren booted the final goal of the match in the third quarter. 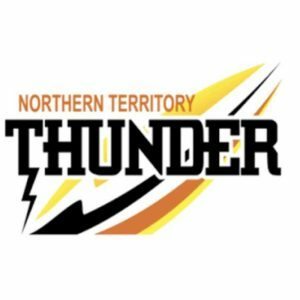 Neither team could manage a goal in the final term, which suited Calder just fine, walking away with the points having restricted the Jets to just three behinds after quarter time. Prespakis was the star of the show, constantly winning possessions around stoppages and bursting away, while Muller and Alana Barba showed promising signs among what was a real team effort from the Cannons who were missing Georgia Patrikios. For the Jets, Grant was productive throughout the match, while Elisabeth Georgostathis had a massive first half and never gave in through the midfield, while Isabelle Pritchard and Cleo Saxon-Jones showed their ability up either end. In Round 2, Calder Cannons face fellow winners Greater Western Victoria (GWV) Rebels, while Western Jets look to get on the board against other Round 1 losers, Murray Bushrangers. Bendigo: J. Jolliffe 2, M. Barton. GWV: I. Simmons 2, R. Saulitis 2. In the second game of the day, spectators were treated to a tight match after quarter time. It all looked to be going pear-shaped for the Pioneers early as Isabella Simmons booted two opening term goals and was joined by fellow middle-ager, Renee Saulitis who split the middle from a tight angle to hand the GWV Rebels an 18-point quarter time lead. With the Pioneers kicking with the breeze in the second term, Madeline Barton snapped a goal off the deck for Bendigo’s first, before Jordyn Jolliffe converted from the set shot to draw within five points at the main break. After half-time, the first goal was crucial and it went to Saulitis who somehow found herself unguarded at the back of a pack close to goal, with the ball falling in her lap, turning around and snapping a goal. The Rebels extended the lead to two straight kicks at the final break having kept the Pioneers scoreless in the term, but with the breeze, Bendigo was always a chance. Jolliffe booted her second major and gave them real hope, though the end-to-end football meant both sides felt like they were close to scoring. In the end, the Rebels managed to hold firm against a gallant Pioneers outfit to win by five points. Brooke Thompson was named as the Rebels’ best, while Nekaela Butler and Nyakoat Dojiok did some of their best work out of defence. Ella Wood and Sophie Molan were a handful in the midfield, while Simmons and Saulitis were busy in the forward half. For the Pioneers, Maeve Tupper, Eloise Gretgrix and Brooke Hards all formed a resilient midfield that stood tall on the day, while Kaitlin Mitchell, Dakota Villiva and Kate Douglass were among others who impressed for the losing side. In Round 2, the GWV Rebels will meet Calder Cannons, while Bendigo Pioneers hope to record a win at home against Eastern Ranges. Northern: B. Gutknecht 4, N. Morris-Dalton, A. Bannan, G. Newton, T. Mills, C. Linssen, M. Appleby, A. Bennett. In the final game of the triple header at Craigieburn, there was a noticeable step-up in decision making and run as last year’s grand finalists, Northern Knights looked every bit a contender once again with a 76-point victory over Murray Bushrangers. In 2018, we saw the Knights had no trouble scoring and it looked to be the case once again, with eight individual goalkickers. Britney Gutknecht was the major beneficiary with four goals, three of which came in the second half. Throughout the day, sides struggled to kick goals into the breeze, with just two of a total 13 goals going through the big sticks up the Grand Boulevard end of RAMS Arena. The Knights found a way though, booting six goals, including four in the final term as they ran away with the contest to record 23 scoring shots to two in an impressive victory. There was no shortage of stars for the Knights with Gutknecht, Gabby Newton, Ellie McKenzie and Jess Fitzgerald all busy, while Maeve Chaplin and Sarah Sansonetti were also named in the best in what could have extended to a few more names as well. For Murray, the largely different side to last season with a lot of new or middle and bottom-age players showed some impressive signs trying to take the game on, but it was hard to get a read because of the strength of the Knights. Olivia Barber tried hard in the ruck throughout the day, while Abby Favell kept running. Ally Morphett and Mindy Quade were named the Bushrangers’ best in the big loss. Murray will have a chance to bounce back in Round 2 when they come up against the Western Jets, while the Knights will meet Oakleigh Chargers who also recorded an impressive win in Round 1. Dandenong: H. Thomas, I. Shannon, J. Radford. Eastern: S. Gibbs, L. McClelland, M. Kendall, S. Collard. Opening the second triple header for the weekend, Eastern picked up their first win in a tight affair over Dandenong in Frankston. 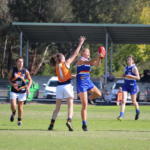 The game broke into the Ranges’ forward half early, but it was Dandenong who drew first blood with Isabella Shannon slotting one from congestion. A revitalised Eastern returned fire in the second with Mietta Kendall hitting the board early. Much of the second quarter continued in Eastern’s forward half with Dandenong defenders getting first hands to the ball but struggling to penetrate the forward press. Eastern were soon rewarded again with a goal from captain, Laura McClelland, while Dandenong remained scoreless for the second. The Stingrays attempted a resurgence following the main break, pushing the ball back up the centre. Jemma Radford kicked Dandenong’s second after snatching the pill mid-flight in congestion to put them within two-points. Though Shae Collard quickly replied for Eastern, snuffing out some of Dandenong’s momentum. In the final period, Harmony Thomas kicked Dandenong’s third while Serena Gibbs secured the win for Eastern in the closing minutes with a big kick from 35 metres out. Though playing without one of their best in captain, Molly McDonald, the Dandenong girls adjusted well with Alice Nagtzaam creating well up forward while Brooke Vernon and Shannon remained prolific. For the Ranges, Olivia Meagher pressured well while Tarni Brown and Tess Flintoff impressed on the move. In Round 2, Eastern Ranges face fellow Round 1 losers, Bendigo Pioneers, while Dandenong Stingrays face fellow losers, Sandringham Dragons. Gippsland Power walked away from Sunday afternoon with a 50-point loss dealt by a dominant Oakleigh side at Frankston Oval. Both teams came out hard in the first, mostly locking the ball down in the midfield with repetitive stoppages. Nikia Webber kicked Gippsland’s first from a gather and snap early on, while Gemma Lagioia responded in the closing minutes for Oakleigh to tie the term. In the second, Oakleigh slowly increased their lead after trapping the ball in their forward line. Emily Harley kicked her first goal after a stray rebound found her teammate. Power tried to shift pressure through the centre, but the Chargers broke their lines and soon found their second through Amelia van Oosterwijck before entering the main break. Gippsland remained scoreless up until the final quarter as the Chargers surged on to kick six more. Kalarni Kearns kicked Oakleigh’s first for the third while Harley added two more as she and her teammates continued to dominate the airways. Harley’s fourth came in the final quarter, increasing Oakleigh’s lead early on, while Power replied with their second following a spill in defence. Van Oosterwijck hit back on the other end with her second with Eliza James soon following with Oakleigh’s final goal. Gippsland captain, Maddison Shaw, and teammates, Grace McRae, Chandra Abrahams and Matilda Van Berkel all combined well despite Oakleigh’s dominance. For Oakleigh, Harley and Van Oosterwijck were enormous in front of goals, while Joanna Lin and Lagioia starred through the centre. In Round 2, Oakleigh Chargers face fellow big winners, Northern Knights, while Gippsland Power face Round 1 winners, Geelong Falcons. Geelong: P. Schaap, R. Tierney, D. Moloney, M. Skinner. Geelong Falcons overcame an early challenge from Sandringham Dragons to post a 26-point win at Frankston. Neither side managed to trouble the scorers in the first term, before Poppy Schaap and Renee Tierney both entered the goal scorers list with majors in the second quarter, while Charli Murphy booted the Dragons’ only score. An incredible goal from Darcy Moloney in the third term, which saw her handball over an opponent, run on and kick the goal,was the Dragons’ highlight of the game, before Mia Skinner extended the Falcons’ lead to 23 points at the final break. A tight third term saw the ball up the Falcons’ end for almost the entirety of the contest, with Geelong scoring the only three behinds of the term. In the end it was enough to walk away with the four points, scoring 4.8 from 12 scoring shots to Sandringham’s one. Luka Lesosky-Hay was the Falcons’ best running through the midfield and teaming up with Lucy McEvoy well, while Paige Sheppard and Skinner provided good support on the outside. For the Dragons, Winnie Laing did well through the middle on the inside, and Marguerite Purcell solid on the outside. While the Geelong midfield got on top, the Dragons’ defence held up well with Sarah Hartwig strong at centre half-back, and players like Alice Burke working hard defensively to reduce the scoring impact of the reigning premiers.